As I mentioned before, the curl documentation needs improvement. As a first step I converted the man page for curl_easy_setopt into no less than 210(!) individual man pages. One new for each option the function supports. The man page was originally (a few days ago) almost 3000 lines, and now with them all split up we end up with a lot more text. This because the new format encourages more text per option and each page now has to detail itself more. This should also make each option much easier to google/search and to link to when we help users understand the options. I’ve made some server-side scripts to generate html versions of them all, I generate a list of all options we have and the examples we host on the web site now have all mentions of the options linked directly to these new pages. The curl_easy_setopt man page will then get most explanations cut out and mainly be used as an index with the options grouped into logical sections to help users find the options they want to use. I could cut out almost 2500 lines. Roadmap of things Daniel Stenberg and Steve Holme want to work on next. It is intended to serve as a guideline for others for information, feedback and possible participation. If you agree, disagree or would like to add stuff you want to work on, please join us on the curl-library list! This “roadmap” is likely to change over time. We’ll keep the updated ROADMAP in git. Implement a dynamic buffer size to allow SFTP to use much larger buffers and possibly allow the size to be customizable by applications. Use less memory when handles are not in use? Embed a language interpreter (lua?). For that middle ground where curl isnâ€™t enough and a libcurl binding feels â€œtoo muchâ€. Build-time conditional of course. 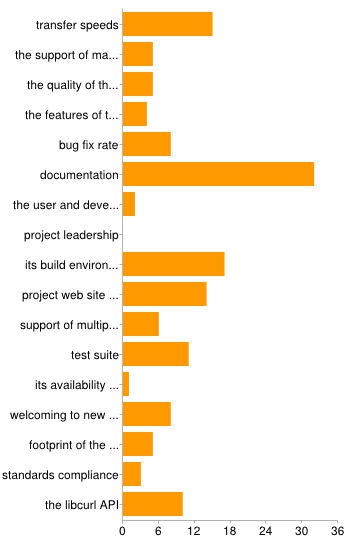 Reading through the answers to the curl project‘s survey “curl and libcurl 2014” is very interesting and educational. After having lead and participated in this project for so long I have my own picture of what we’re good and bad at. That’s not exactly the same image I get when I read the survey responses. That’s of course the educating part and I really want to learn from this poll and see where to put in some efforts and attempt to improve. At the same time I’ve been working for a while to put together a roadmap for the project, and the survey will help guide us with that work as well. The full generated summary of the answers can be found on the site, but I thought I do the extra effort here and try to extrapolate data, compare and try to get to the real story that lurks in the shadows. Over the almost 10 days the poll was open, we received 194 responses. I was hoping for more participation, but on the other hand I don’t think more people would’ve given a much different view. My only concern would be that I’m not sure exactly how well we reached out. Almost all curl users use it for HTTP and HTTPS. Sure, we also use a lot of other protocols and in fact all supported protocols did up having at least two users according to the survey, but only a single digit percentage did not mark HTTP and HTTPS as protocols they use. The least used supported protocol gopher, is used among 1.5% of the users who responded. FTPS and SFTP are basically equally much used and they are the 4th and 5th most used protocols. HTTP, HTTPS and FTP are clearly our most popular protocols. Only one in five users use curl on a single platform. All others use it on two or more, and one if four use it on four or more with an unexpectedly high 11% saying they use it on 5 or more platforms! That’s a pretty strong message to me that our multi-platform strategy is important. Our users have been with us for a long time. Half of the users have been using curl for five years or more! A fifth has been with us for 8 years or more! And yet there seems to be a healthy amount of newcomers finding us as 14% is within their first year. The above numbers combined, I’m not surprised but only happy to see that 4 out of 5 users are also involved in other open source projects. curl is just one piece in a large ecosystem and I think it is good that we all participate in several projects so that we learn and cross-pollinate where possible! Less than half of the respondents are subscribed to a curl mailing list, and curl-library is the most popular one. This also reflects in subscriber numbers on the actual mailing lists where curl-library with its 1400+ members has almost twice as many subscribers as curl-users. One way to view this is that we are old enough, established enough and working enough so that users don’t have to subscribe to our lists to keep up. The less optimistic way to see it could be that this is because we haven’t reached out good enough or that our mailing list culture/setup isn’t welcoming enough. Perhaps most surprising to me: that several persons got upset and reacted strongly to the question about how good we treat “female and other minorities” in the project. To me there’s no doubt that female contributors are a minority in the curl community and I want to learn if we’re doing our best to be inclusive and open to all possible contributors. Or at least how good/bad people think we are doing. 29% of the respondents have contributed patches, meaning 56 individuals. I think that tells more about the ones who took part of the survey than it measures participation level among “regular users”. A big revelation for me was the question where I asked people to identify the “worst parts” of the project. The image here below is the look of the summary. It quite clearly identifies “documentation” as the area in most need of improvements. Some collections of docs are just too big and hard to find in, like the curl man page and the curl_easy_setopt man pages. We need to split them up and/or rearrange somehow to help people find the info they need. Work has started on this. I’ll follow up with details later. We get slightly bad “reviews” on this when people confuse the libcurl bindings’ lack of docs to be our problem. Lots of libcurl bindings are not very good documented – but they are separate projects not controlled or documented by us. I don’t know what we can do to help that situation. Suggestions are very welcome! We don’t have much step-by-step tutorials on how to get started and how to knit things together. We mostly provide reference manuals. I will appreciate help with improving this! Update: parts of the change mentioned in this blog post has subsequently been reverted since clearly I had a too positive view of the Internet. One of the first bugs that fell into my lap when I started working for Mozilla not a very long time ago, was bug 237623. Anyone involved in Mozilla knows a bug in that range is fairly old (we just recently passed one million filed bugs). This particular bug was filed in March 2004 and there are (right now) 26 other bugs marked as duplicates of this. Today, the fix for this problem has landed. The core of the problem is that when a HTTP server sends contents back to a client, it can send a header along indicating the size of the data in the response. The header is called “Content-Length:”. If the connection gets broken during transfer for whatever reason and the browser hasn’t received as much data as was initially claimed to be delivered, that’s a very good hint that something is wrong and the transfer was incomplete. The perhaps most annoying way this could be seen is when you download a huge DVD image or something and for some reason the connection gets cut off after only a short time, way before the entire file is downloaded, but Firefox just silently accept that as the end of the transfer and think everything was fine and dandy. What complicates the issue is the eternal problem: not everything abides to the protocol. This said, if there are frequent violators of the protocol we can’t strictly fail on each case of problem we detect but we must instead do our best to handle it anyway. Is Content-Length a frequently violated HTTP response header? Back in the HTTP 1.0 days, the Content-Length header was not very important as the connection was mostly shut down after each response anyway. Alas, clients/browsers would swiftly learn to just wait for the disconnect anyway. Back in the old days, there were cases of problems with “large files” (files larger than 2 or 4GB) which every now and then caused the Content-Length: header to turn into negative or otherwise confused values when it wrapped. That’s not really happening these days anymore. In curl‘s HTTP parser we’ve always been strictly abiding to this header and we’ve bailed out hard on mismatches. This is a very rare error for users to get and based on this (admittedly unscientific data) I believe that there is not a widespread use of servers sending bad Content-Length headers. It seems Chrome at least in some aspects is already much more strict about this header. My fix for this problem takes a slightly careful approach and only enforces the strictness for HTTP 1.1 or later servers. But then as a bonus, it has grown to also signal failure if a chunked encoded transfer ends without the ending trailer or if a SPDY or http2 transfer gets prematurely stopped. This is basically a 6-line patch at its core. The rest is fixing up old test cases, added new tests etc. As a counter-point, Eric Lawrence apparently worked on adding stricter checks in IE9 three years ago as he wrote about in Content-Length in the Real World. They apparently subsequently added the check again in IE10 which seems to have caused some problems for them. 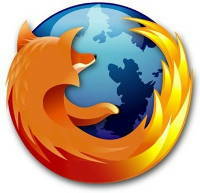 It remains to be seen how this change affects Firefox users out in the real world. I believe it’ll be fine. This patch also introduces the error code for a few other similar network situations when the connection is closed prematurely and we know there are outstanding data that never arrived, and I got the opportunity to improve how Firefox behaves when downloading an image and it gets an error before the complete image has been transferred. Previously (when a partial transfer wasn’t an error), it would always throw away the image on an error and instead show the “image not found” picture. That really doesn’t make sense I believe, as a partial image is better than that default one – especially when a large portion of the image has been downloaded already. On June 5th, around thirty people sat down around a huge table in a conference room on the 4th floor in the Google offices in New York City, with a heavy rain pouring down outside. Most people present knew many of the others already, which helped to create a friendly familiar spirit and we quickly got started on the Thursday morning working our way through the rather long lits of issues to deal with. When we had our previous interim meeting in London, I think most of us though we would’ve been further along today but recent development and discussions on the list had actually brought back a lot of issues we though we were already done with and we now reiterated a whole slew of subjects. We weren’t allowed to take photographs indoors so you won’t see any pictures of this opportunity from me here. We started out with the topic of “extensions”. Should we revert the decision from Zurich (where it was decided that we shouldn’t allow extensions in http2) or was the current state of the protocol the right one? The arguments for allowing extensions included that we’d keep getting requests for new things to add unless we have a way and that some of the recent stuff we’ve added really could’ve been done as extensions instead. An argument against it is that it makes things much simpler and reliable if we just document exactly what the protocol has and is, and removing “optional” behavior from the protocol has been one of the primary mantas along the design process. The discussion went back and forth for a long time, and after almost three hours we had kind of a draw. Nobody was firmly against “the other” alternative but the two sides also seemed to have roughly the same amount of support. Then it was yet again time for the coin toss to guide us. Martin brought out an Australian coin and … the next protocol draft will allow extensions. Again. This also forces implementation to have to read and skip all unknown frames it receives compared to the existing situation where no unknown frames can ever occur. A rather given first candidate for an extension was the BLOCKED frame. At the time BLOCKED was added to the protocol it was explicitly added into the spec because we didn’t have extensions – and it is now being lifted out into one. What received slightly more resistance was the move to move out the ALTSVC frame as well. It was argued that the frame isn’t mandatory to support and therefore easily can be made into an extension. Another small change of the wire format since draft-12 was the removal of the high byte for padding to simplify. It reduces the amount you can pad a single frame but you can easily pad more using other means if you really have to, and there were numbers presented that said that 255 bytes were enough with HTTP 1.1 already so probably it will be enough for version 2 as well. There will be a new draft out really soon: draft -13. Martin, our editor of the spec, says he’ll be able to ship it in a week. That is intended to be the last draft, intended for implementation and it will then be expected to get deployed rather widely to allow us all in the industry to see how it works and be able to polish details or wordings that may still need it. We had numerous vendors and HTTP stack implementers in the room and when we discussed schedule for when various products will be able to see daylight. If we all manage to stick to the plans. we may just have plenty of products and services that support http2 by the September/October time frame. If nothing major is found in this latest draft, we’re looking at RFC status not too far into 2015. I think we’re closing in for real now and I have good hopes for the protocol and our progress to a really wide scale deployment across the Internet. The HTTPbis group is an awesome crowd to work with and I had a great time. Our hosts took good care of us and made sure we didn’t lack any services or supplies. Extra thanks go to those of you who bought me dinners and to those who took me out to good beer places! Yeah, it will now become somewhat out of date and my plan is to update it once the next draft ships. I’ll also do another http2 presentation already this week so I hope to also post an updated slide set soonish. Stay tuned! My plan is to cooperate with the other Wireshark hackers and help making sure we have the next draft version supported in Wireshark really soon after its published. Most of the differences introduced are in the binary format so nghttp2 will need to be updated again – it is the library curl uses for the wire format of http2. The curl parts will need some adjustments, for example for Content-Encoding gzip that no longer is implicit but there should be little to do in the curl code for this draft bump. In August 2007 the IETF HTTPbis work group started to make an update to the HTTP 1.1 specification RFC 2616 (from June 1999) which already was an update to RFC 2068 from 1996. I wasn’t part of the effort back then so I didn’t get to hear the back chatter or what exactly the expectations were on delivery time and time schedule, but I’m pretty sure nobody thought it would take almost seven long years for the update to reach publication status. On June 6 2014 when RFC 7230 – RFC 7235 were released, the single 176 page document has turned into 6 documents with a total size that is now much larger, and there’s also a whole slew of additional related documents released at the same time. 2616 is deeply carved into my brain so it’ll take some time until I unlearn that, plus the fact that now we need to separate our pointers to one of those separate document instead of just one generic number for the whole thing. Source codes and documents all over now need to be carefully updated to instead refer to the new documents. And the HTTP/2 work continues to progress at high speed. More about that in a separate blog post soon. More details on the road from RFC2616 until today can be found in Mark Nottingham’s RFC 2616 is dead.